You tell me. They say a picture says a thousand words. 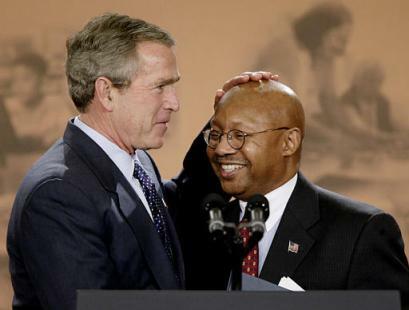 This one, of Bush “rubbing the head” of an African American gentleman, Alphonso Jackson, acting Secretary of the U.S. Department of Housing and Urban Development (click for story), just screams “RACIST” over and over and over. This is absolutely disgusting. No, this is not a doctored picture. This is George Bush playing on the old “rub a black man’s head for good luck” racist card. What a jackass.